So yesterday was my trip to the Blossom Music Center, right outside of Cleveland, to partake in the very first Kuyahoga Festival. Out of the 15 bands in attendance, I was able to catch 6 performances. The first band I saw upon arrival were the Six Parts Seven, an instrumental band from Akron who I was really not familiar with. They evoked a more rustic Sigur Ros vibe, and were a quiet and enjoyable way to start the festival off. Next, we made our way to Blossom's main stage for a short set by the Hold Steady. Again, I wasn't really familiar with their work, but found them to be pretty enjoyable. The lead 'singer' doesn't really sing, he basically talks while his band lays a groove out in the background. I didn't catch to many of the lyrics, mainly due to their sheer volume, but they mostly sounded like angry rants against something or other. The music itself was reminiscent of the fast, simple rock of Guided By Voices. After this set, I headed back over to the side stage to see buzz-band Wolfmother. I must say, I wasn't expecting much, having only heard their lackluster single "Woman". But these guys actually delivered, going heavy on the jamming (only 4 songs in half an hour) and providing a faithful rip-off of the 70's metal genre. 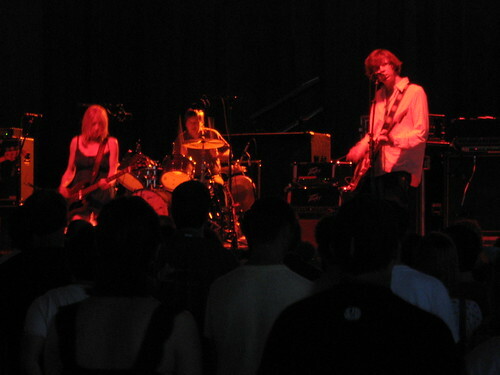 By the time Sonic Youth took Blossom's main stage, it was high time for a defining performance at the festival. Thruston Moore and friends were more than happy to oblige. Sonic Youth ripped through a one and a half hour set that focused quite a bit on cuts from their newest album Rather Ripped. The set kicked off with the catchy single "Incinerate" and included the slow burning "Do You Believe in Rapture? "as well as the spiraling noise of "Pink Steam". Thurston and Kim Gordon split the singing duties pretty equally, and even handed the mic over to guitarist Lee Ranaldo for a few numbers. The highlight of the set was an out-of-the-blue comment from Thurston, in which he referred to my hometown of Delaware as the coolest town in Ohio. It feels good to be living in a Thurston Moore-indorsed town! The set wound down with a few older songs including "Catholic Block" and "Shaking Hell". Between Moore's and Ranaldo's expert guitar-work and Gordon's strangely seductive dancing, Sonic Youth set the bar pretty high for the remainder of the festival. We decided to skip the first half of the Death Cab for Cutie set, but came back for the slightly less mellow second half. The only real highlight of their set was when Wayne Coyne and Steven Drozd of the Flaming Lips joined Death Cab on stage for an off the cuff rendition of R.E.M. 's "Cuyahoga", in honor of the location of this festival. As night fell upon Blossom, anticipation ramped up for the Flaming Lip's epic appearance. A giagantic video screen was erected on the stage, and dancers dressed as Santas and aliens took positions on either side. 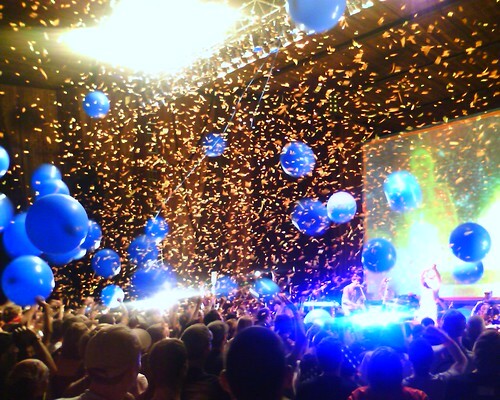 The Lips themselves took the stage in a blast of smoke, confetti, streamers and balloons, launching into the traditional opener "Race for the Prize". The rest of the night was a selection of some the best songs from their latest record At War With the Mystics such as "Free Radicals", "The W.A.N.D. ", "The Yeah Yeah Yeah Song", "Vein of Stars", and "My Cosmic Autumn Rebellion". We were also treated to "Yoshimi Battles the Pink Robots Pt. 1 & 2" which included a big sing-a-long between the movements. Wayne and company seemed like they were having a total blast onstage. They definately drew the biggest crowd of the night, and got the largest reaction due to the sheer spectacle of their performance. The highlight of the main set for me was a performance of the old Lips hit "She Don't Use Jelly" which also recieved the sing-a-long treatment. The main set closed out with the ultimate life/death ballad "Do You Realize?? ", and a short wait ensued before the band returned to the stage for one last song. The encore performance of "War Pigs" pulled out all the stops as far as spectacle was concerned. There were gratuitous amounts of confetti, streamers, and smoke accompanied by some hard-hitting social commentary projected onto the video screen. Overall, the experience was amazing and just makes me that much more eager for their August 28th preformance at Promowest.